UV light sources (such as UVA and UVB) have potential to be beneficial in the world of land hermit crabs. UV Lighting can even go as far as helping molts, creating a stronger color, helping land hermit crabs digest food, and also increasing activity level. 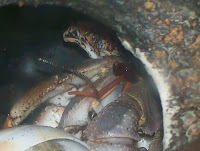 Throughout this article, I will examine the effects that UV has had on my crabs since being introduced. As far as molting goes, my crabs have always molted well. After introducing UV light, I have noticed no true different in my hermit crab's molting behaviors. However, I do believe that introducing UV has helped my land hermit crab's color and activity level. Getting a UV light source for land hermit crabs seems to help them in one way or another. Having an active day and night cycle mimics what you would find in nature, and having the most natural settings reduces stress and creates the most comfortable environment for your land hermit crabs, which results, in the end, for a long, healthy life.